This is a unique wooden decor on stand. Made from good quality wood, it is durable and will stay in topnotch condition for many years. There is an abstract figurine with a hollow rested on two sleek metallic stands, which is supported by a flat base. Keep it on any table in the living room, bedroom or hallway for a dramatic touch. A smart alternative to table decors is this wooden decor, which will certainly win you, praises from many. Easy to maintain, regular dusting with a dry cloth will keep its look intact. 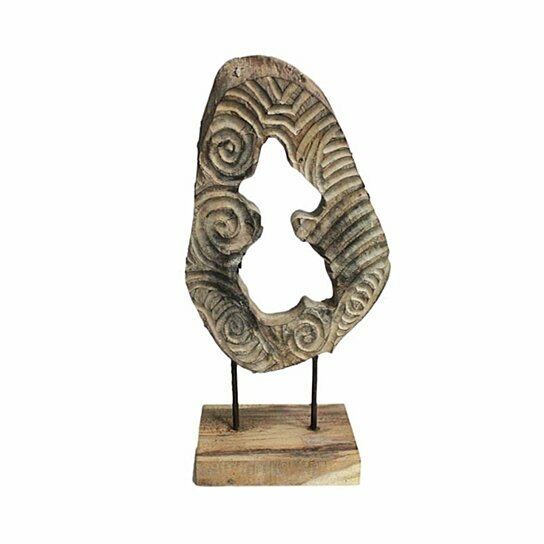 It is an abstract figurine with an antique look. It is supported on a sleek iron stand. Perfect for any home decor as well as for office decor also.